As I mentioned before, I did finally manage to spare a bunch of beets from the pickling brine. 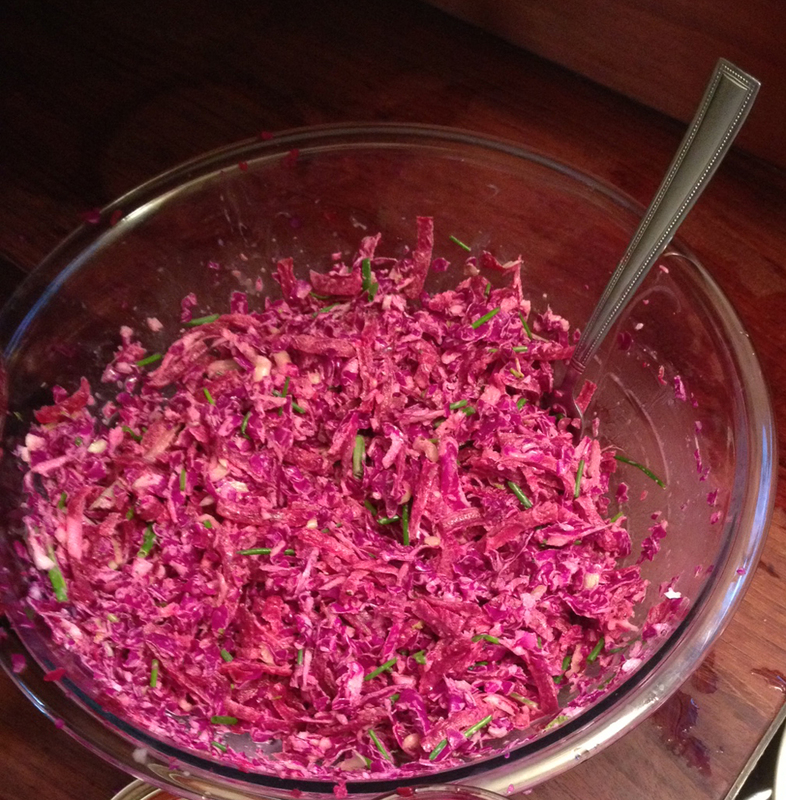 Instead, I used my fancy (but fussy) Magic Bullet blender’s shred option and shredded the beets, as well as half a head of red cabbage and a fennel bulb to make a coleslaw that I developed right after college when I first discovered beets. It is a fresh compliment to any barbecue or fried chicken, and it’s filling enough to be a mini meal. Shred or finely chop the cabbage, beets, fennel, apple, and scallions. Before adding the shredded beets to the mixture, boil for 4-5 minutes, drain, and rinse with cold water. Note that with the fennel, it’s up to you if you want to use the wispy top section (I do), in which case you only need about half a bulb and 1/3 of the green wisps on the bulb. Whisk together all the dressing ingredients and stir in to the pile of shredded goodies. Depending on how much salad you have, this may be too much or not enough dressing. It’s easy to drain off the excess or whip up a little more if necessary. Also, you may want to reduce the mayo and up the vinegar or lemon juice, but it really isn’t a mayonnaise-y slaw. It’s also very open to experimentation. I’ve added walnuts or other nuts, and I’ve left out or substituted each main ingredient (except cabbage) at least once, depending on what I have on hand. Slaw is a forgiving dish! Not my best picture ever… but still, delicious. Mmmmm I want all of your delicious treats! I miss them and I miss you!